You guys may or may not know this, but one of my biggest makeup related regrets is not picking up the Anastasia Beverly Hills Gleam Glow Kit before it disappeared. Honestly, I had every intention of picking it up, but I just never got around to it and then it was discontinued and I was very, very disappointed. 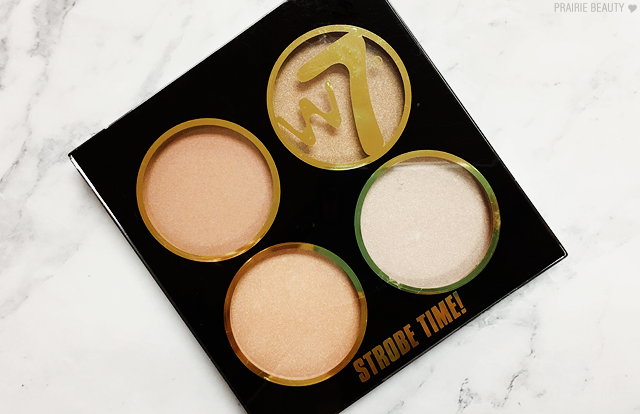 Recently, while perusing the makeup section at my local Winners, the w7 Strobe Time Highlighting Palette in It's Glow Time caught my eye and I couldn't help thinking it reminded me a heck of a lot of the Gleam palette I'm still mourning the lack of. So, of course, I picked it up. Now, this review obviously won't be a dupe comparison since I don't have Gleam to compare it to, but I wanted to give you my thoughts on it anyway! 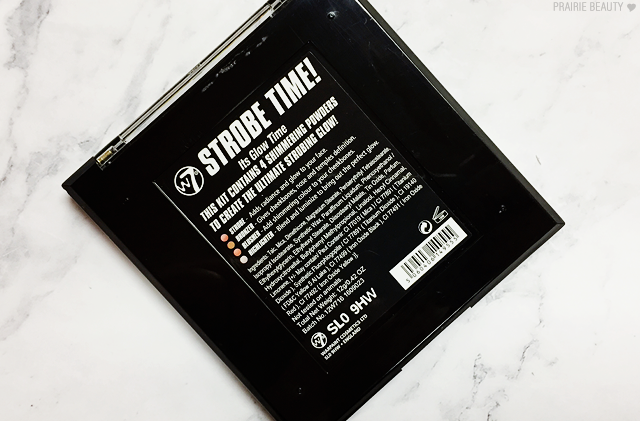 It's time to get strobing! It's Glow Time! 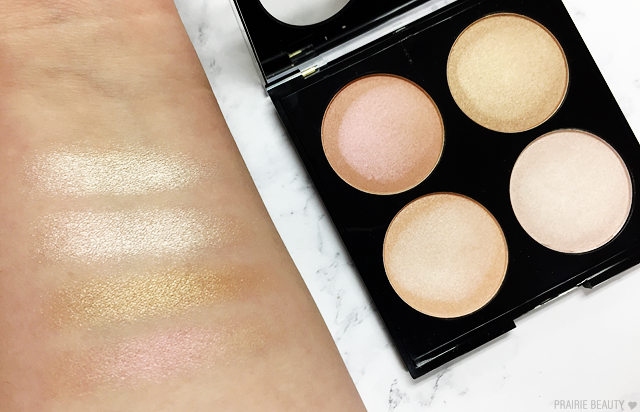 contains champagne shades for that popping highlight and pinky nudes for a more natural glow. 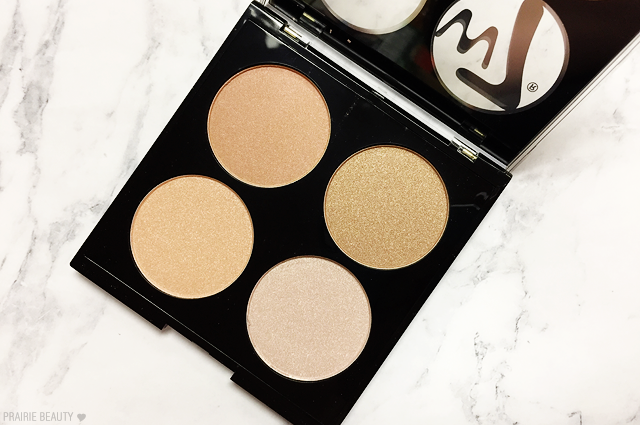 The lightest shade is perfect to blend into your cheekbones for that extra pop. 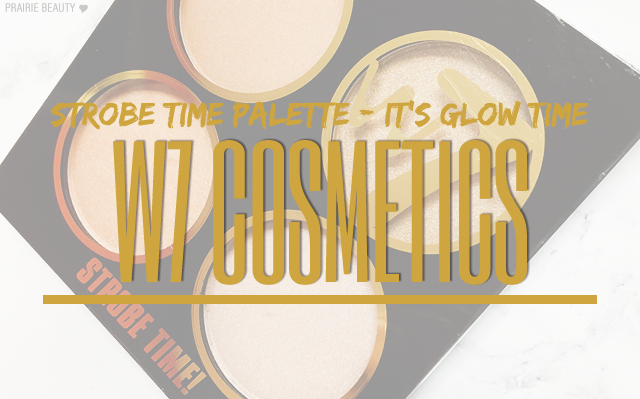 If you're unfamiliar with w7 as a brand, they're a UK brand that seems to be most well known for their dupes. The most popular ones I've seen are their NAKED palette dupes, which come in the same kind of tin packaging as the NAKED 2 & 3 palettes. I've also seen dupes from them that resemble Benefit, Hourglass, Bobbi Brown and Charlotte Tilbury. I'm not going to weigh in on the discussion of these kinds of dupe type products, but if that's not something that you're down with then this product probably isn't for you. The thing that really drew me in about this palette initially was the shade selection. On first glance, I wasn't entirely sure, but as I looked closer I felt like I could definitely make at least two of the shades work on my skin tone and felt pretty confident that at the very least the rosy shade would be a good blush topper for me. Apologies for the upside down swatch order! The Blusher shade in the top left corner is a bit of a surprise for me. While it does have a strong rosiness to it, making it more of a blush topper than a traditional highlight for my skin tone, there's a really interesting duochrome feel to the shade. Swatched and applied, it definitely pulls a lot more pink than it initially looks in the pan. The Bronzer shade is a pretty standard gold with a ton of sheen, which I think would look absolutely stunning on deeper skin tones as a highlighter. Admittedly, it will likely end up as an eyeshadow for me since I'm not a big fan of glowy bronzer personally. Because the shades aren't specifically labelled, I'm assuming that the shade on the bottom left of the palette is the Strobe shade. This is the shade that has a slight peachiness to the undertone, making it appear a little bit more natural on my skin tone while still packing quite a highlighted punch to the cheeks. It's also my favorite shade, because applied lightly it can look quite natural but applied more heavily it can be downright blinding. Finally, the Highlight shade is a traditional champagne that is quite light and has a really neutral undertone, making it really great for fair to light skin tones. This shade is gorgeous and I think it'll be the one I'm most likely to reach for in the winter when I don't wear as much bronzer and want a lighter, more ethereal highlighter. Something that I was really impressed with from this palette was the texture of the powders. I've actually been quite disappointed with some w7 products I've tried in the past because the powders were chalky or lacking in pigmentation, but these powders are really smooth and creamy without being chunky or hard to blend. I've applied these with a fluffier brush for a light wash of glow and and with a more dense brush for a more intense highlight. With both brushes, I've found that the product picks up and applies easily. Overall, I'm actually really, really happy with this purchase. 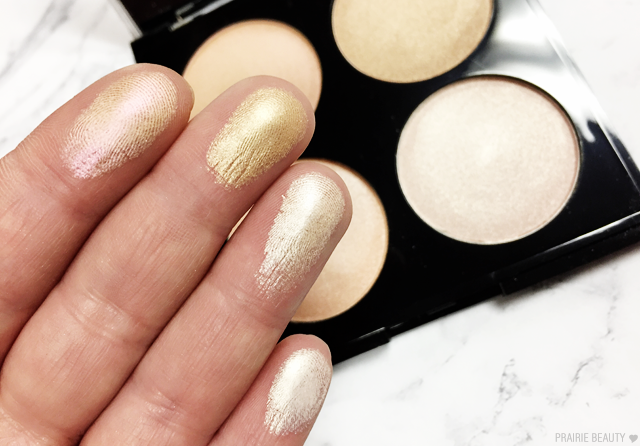 Because these highlighters definitely pack a lot of punch, it's a little bit outside of my personal comfort zone, but I think very on trend at the moment with the highlight craze that's happening at the moment. The powders are great quality and the shade selection is fantastic for lighter skintones. 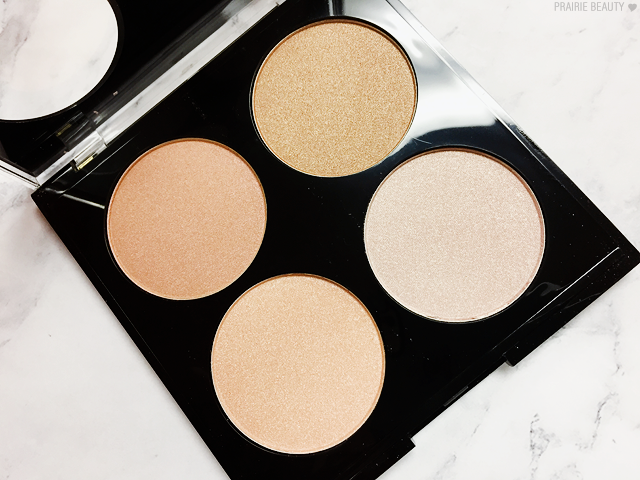 This palette is also available in a warmer toned option called Vivid Glow that I think would be more suited to people who like a more golden highlight. In Canada, I've consistently seen w7 products on shelves at Winners and Marshalls, but they're also widely available online if you just look around!